In 2004, Rebecca opened Thairapy Plus Salon and Spa. After years of working in Chicago she felt it was time to open a neighborhood shop to showcase her talents. She has always wanted to contribute to her community and to make a difference by way of her lifelong passion for her trade. Rebecca named the salon Thairapy Plus with a vision that if you visit her salon you will leave feeling centered, educated, without stress - plus, gorgeous! Every person in her chair is considered a good friend and shares a kindred spirit. Personal consultations are only the beginning of long relationships that even span the globe, with clients coming in as far as Singapore for her hair dressing skills. Her specialties include maximizing potential for fine haired clients, the art of color correction and barbering. Creating styles her clients can work with at home is always at the forefront of her mind, to leave without a thorough understanding of how to recreate your style at home is not an option. Kerry joined the Thairapy Plus team in 2009, bringing with her over 12 years of experience in both hair design and business administration. Kerry was introduced to the Wella family while living in San Francisco. 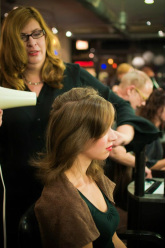 Her time with them reignited her desire to style and eventually brought her to Chicago. Kerry’s broad range of continuing education has taken her through many coloring and styling classes and she loves working with the combination of both to give every client an individual and inspired new look. She is known for her extraordinary abilities in event styling. Whether its a Friday night out or bride's special day, she is able to design awe inspiring styles that look amazing and last all night. Laura has worked both behind the chair and in management positions. She also has been a trainer for new stylists, utilizing her love of education. Learning and growing is what inspires Laura. Taking classes here and abroad, including Toni & Guy color techniques in London, she loves bringing her new skills to each client for a personalized experience. Perming; Keratin Treatments and Color compliment her beautiful hair cuts. "Being an esthetician is my true passion!" Being given the opportunity eto educate guests about their skincare concerns and create a treatment plan as well as achieve goals in a relaxing environment is truly fulfilling to Mandy. "There are variety of innovative services to offer, and I love building relationships with my guests". Mandy has been in the beauty industry for over a decade. Her love of makeup took he to school at Makeup First School of Artistry. After learning the art of makeup application and how the ingredients affect the skin, she decided to return to school to address all things skin. In 2014, Mandy became a licensed esthetician, specializing in facials, peels, waxing and airbrush tanning. She went on to complete the expert program at the International Dermal Institute. Carmen began her career at Thairapy Plus in 2008 after graduating from the Botanic School of Nail Technology. Shortly after, she received her Cosmetology license and has joined Thairapy's team of stylists. ​Her Sassoon training shows in her beautiful haircuts. She will never completely step away from nails, as she feels strongly about the health of the individuals nails. Carmen's 20 years of experience (including a career as a nail technician in Romania) ensure that she will address concerns appropriately. She is certified in LCN gels, a safer and gentler alternative to acrylics, and a firm believer in the longevity of no-chip manicures. People find themselves falling in love with both the deliberate care Carmen takes during her services as well as her ability to listen and relate to her clients whether they are old faithfuls or new to the salon/spa.